I'm sure you all remember the review I wrote of Fresh Wave and their incredible Stinky Dorm Kit. Well, I have the distinct pleasure of introducing to you two new products: The Fresh Wave Laundry Supplement and the Carpet Shake. Using a proprietary blend of water and natural plant oils, Fresh Wave's chemistry started as an industrial solution for wastewater treatment facilities, paper mills, asphalt plants -- some of the world's smelliest places -- and trickled into a consumer solution that can be found at Bed Bath & Beyond, Whole Foods Market, Ace Hardware and a host of other trusted retailers. Instead of masking odors, Fresh Wave eliminates them completely using a non-toxic, non-hazardous, fragrance-free formula that's safe to use around children and pets. 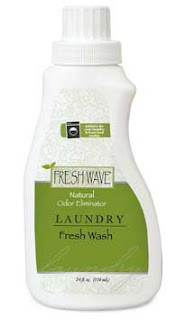 Fresh Wave® Fresh Wash is perfect for eliminating laundry odors in all types of fabrics, adding anywhere from three to seven ounces per wash load. And no owner of a front-load washing machine should be without Fresh Wash to neutralize the nasty smell that lives in the rubber gasket around the door. For deodorizing laundry - add two capfuls to the wash cycle. If treating significant odor issues add one to two capfuls more. To remove odors from Front Load Washer, apply to rubber gasket around the rim of the door with a soft cloth, then wipe dry. Natural odor eliminating Fresh Wave Carpet Shake in a 6 oz. container that deodorizes odor plagued rugs and carpeting. Safe to use around people and pets. We eliminate the odors carpet cleaners can’t get out. 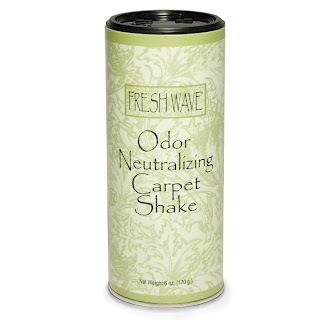 Shake, shake, shake your carpet odor away with Fresh Wave® Carpet Shake. Few things absorb and hold odors as well as your carpeting. From spilled food to pet odors, cigarette smoke to sweaty feet, your carpet is exposed to a lot of bad smells. Not to mention must, dust and even pet accidents. But a sprinkling of unscented carpet odor eliminator - using natural ingredients - can safely and effectively get rid of smells. For the ultimate carpet and rug deodorizing feat, add the Fresh Wave Pearl Packs to your vacuum to prevent odors from re-entering the room via the vacuum’s exhaust. The generous folks at Fresh Wave have offered one of my readers a container of Fresh Wash and a canister of Carpet Shake! I received a Carpet Shake and Fresh Wash from Fresh Wave for the purpose of review. I was under no obligation to write a review. I received no monetary compensation. The opinions expressed herein are my own and based on my use of and experience with the item(s). I'd like to try the Crystal Gel. I need the Stinky Dorm Kit for my son's bathroom. Geez! I'd have to choose the stinky dorm kit - for the furnace room my husband's hockey equipment is stored in. I would love to try the Vacuum Pearls!!! great idea! I want to try the Home Spray.. I'd really like to try the pet shampoo! 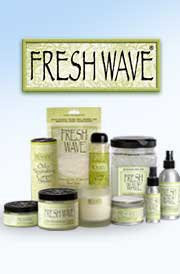 I really want to try their Natural odor eliminating soy-based Fresh Wave Kitchen Candle in a 7 oz. !!! I would like the vaccum pearls. I would really love to try the fresh carpet shake! I would also like to try the vacuum pearls. My vacuum gets so stinky from vacuuming the dog hair. I would love to try the Natural Air Freshening Spray!